The penitentiary system shall comprise treatment of prisoners the essential aim of which shall be their reformation and social rehabilitation. It is hard to rejoice about a 50-year sentence being imposed on a 65-year old, no matter how heinous and terrible the crimes he committed may have been. Fifty years is not the highest sentence ever imposed by an international criminal tribunal. 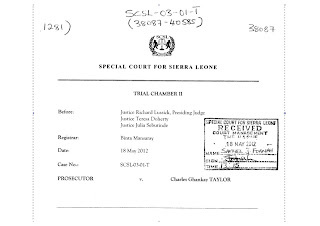 A few years ago, the same Special Court for Sierra Leone imposed a sentence of 52 years. But none of the other tribunals has ever imposed such a high sentence. Not even close. The judges of the Special Court will explain that they need to do this because they cannot impose a sentence of life imprisonment, which seems to be excluded by the Statute of the Special Court. At the International Criminal Tribunal for the former Yugoslavia, this option is available, although it has only rarely been used. At the International Criminal Court (which has never yet imposed a sentence), there is a maximum sentence of 30 years. The judges may also impose a life sentence “when justified by the extreme gravity of the crime and the individual circumstances of the convicted person”. However, the sentence is subject to a mandatory review after 25 years. What is troubling about the 50-year sentence given to Charles Taylor is the implicit message that he should never be released. There is provision in the Rules of Procedure and Evidence for a reduction in the sentence at some point in the future. But nothing in the Statute of the Court or in the Rules gives Charles Taylor the right to seek reduction in the sentence at any point in time. There is the haunting precedent of Rudolf Hess, the only Nazi defendant to be given a life sentence at Nuremberg. Of course, the majority were sentenced to death. But some of the Nazi villains, like Albert Speer, were given sentences of 20 years. Hess server more than thirty years of his sentence, unable to achieve any form of release because of differences of opinion at the political level. He tried, unsuccessfully, to bring his case to Strasbourg. He finally committed suicide. The Special Court for Sierra Leone could have achieved the same result with a sentence of 25 or 30 years. Indeed, it is for this reason that the other international criminal tribunals, as well as justice systems of most countries, do not generally impose custodial sentences with fixed terms greater than 25 or 30 years. As article 10 of the Covenant recalls, a detention regime must never lose sight of the ‘inherent dignity of the human person’. The ‘essential aim’ must be ‘reformation and social rehabilitation’. If we fail to honour his human dignity, we damage our own. There is no reason why Charles Taylor cannot be reformed and rehabilitated. This must not be forgotten as the Court attempts to find a sentence that adequately reflects the horror of the crimes that he committed. Yvonne McDermott sends a very helpful and complete account, reproduced below. As the conclusion indicates, the colleagues of Judge Sow decided that his rather frustrated and ineffective attempt to make a short statement at the end of the delivery of the summary of the Taylor judgment makes him 'unfit' to be a judge. They cannot, however, remove him from office. They can only recommend that this be done by the Secretary-General of the United Nations, and this is what they have done. Pending a determination by the Secretary-General, they have suspended him from sitting. The authority for this is Rule 24(iii), which states: 'The Judges shall meet in Plenary to... (iii) Decide on matters relating to the internal functioning of the Chambers and the Special Court.' Suspending a judge from sitting in a case, when the Rules themselves say that he is required to be present at every hearing, seems an extraordinarily serious measure to be based upon such a vague provision. "Before proceeding today, it gives us no pleasure to have to place on record some explanation for the extraordinary situation which occurred at the end of the previous sitting of the Trial Chamber on 26th of April, 2012, on which date the Trial Chamber delivered its summary judgement. The behaviour of Judge Sow was referred by the Council of Judges to a plenary meeting of the Judges of the Special Court. We three Trial Chamber Judges abstained from voting at that plenary. I will now read onto the record the resolution of the plenary. 'Resolution on complaint by Trial Chamber II against Justice Malick Sow. The Judges of the Special Court for Sierra Leone sitting on the 7th and 10th of May, 2012, in the 17th plenary of Judges, pursuant to Rule 15 bis (B) of the Rules of Procedure of Evidence of the Special Court which mandates the Council of Judges who refer an allegation of unfitness of a Judge to sit to the plenary if it determines that, one, the allegation is of a serious nature, and two, that there appears to be a substantial basis for same. 1. The plenary declares that Justice Malick Sow's behaviour in court on the 26th of April, 2012, amounts to misconduct rendering him unfit to sit as an Alternate Judge of the Special Court. 2. The plenary recommends to the appointing authority pursuant to Rule 15 bis (B) to decide upon the further status of Justice Malick Sow. 3. Pursuant to Rule 24(iii), the plenary directs Justice Malick Sow to refrain from further sitting in the proceedings pending a decision from the appointing authority. What Happened to Judge Sow? 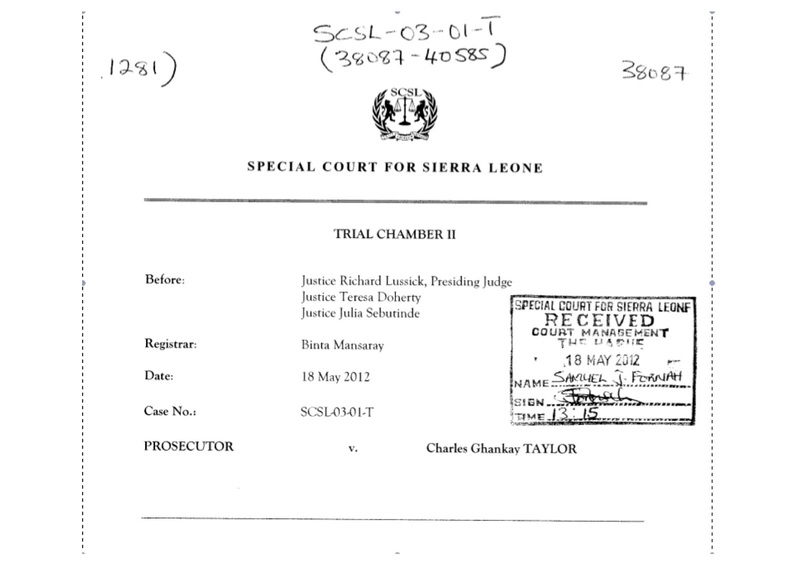 Earlier this week, the full judgment in the Charles Taylor case was issued. It runs to more than 2,500 pages – something that earns it a place in the Guinness Book of World Records – and I hope readers of the blog will understand if a detailed analysis is not yet forthcoming. But there is something puzzling on page 1 of the final judgment. The name of Judge Malik Sow is missing. Judge Sow served throughout the trial as an Alternate Judge. Rule 16bis, entitled Alternate Judges, says ‘An alternate Judge … shall be present at each stage of the trial or appeal to which he or she has been designated.’ The sentencing hearing was part of the trial. 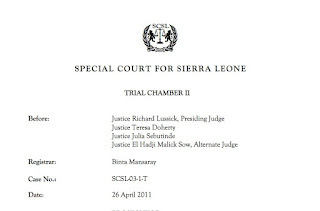 Judges at the Special Court for Sierra Leone are appointed either by the Secretary-General of the United Nations or by the Government of Sierra Leone. Judge Sow was appointed by the Secretary-General. He was present throughout the Trial and for the delivery of the judgment on 26 April 2012. His name appears on the summary of the judgment, which was distributed on 26 April 2012. When the judgment was first issued in summary form, a few weeks ago, Judge Sow made a public objection which is discussed in an earlier post on the blog. But apparently he was not present when the sentencing hearing took place last week. There is nothing on the website of the Court that I could find to explain this. I was told, informally, that the Plenary of the Court, composed of all of the judges, issued a decision removing him from case. This week's full judgment is supposed to include a 'Procedural History' as an annex, and surely that is where such a development must be explained. But it is missing from the full version of the judgment that was distributed. Can readers of the blog assist in clarifying the procedure, and the legality, of removing a judge while a case is in progress? Judge Sow still appears on the website as a judge of the Court. I don't believe he has been removed from office. In any case, I think that can only be done by the Secretary-General of the United Nations. The Rules of Procedure and Evidence says a judge may not sit in a case ‘in which his impartiality might reasonably be doubted on any substantial ground’ (Rule 15). But from what I understand of the events in the courtroom on 26 April 2012 this is not the problem. Nothing Judge Sow said that day suggests a lack of impartiality. It is also possible for a judge to be deemed ‘unfit to sit’ (Rule 15bis). It provides for a rather complex procedure involving referral by the President to the Council of Judges who then refer the matter to the Plenary Meeting which makes a recommendation to the body which appointed the judge. But this is really a procedure for removal from office, it seems. And presumably Judge Sow has not been removed from office. So should he not have been in the courtroom for the sentencing hearing, and should his name not have appeared on the judgment? How can a judge be part of a summary of a judgment yet absent from the judgment itself? There may be a good explanation for all of this. It should be public. It is not good for international justice that such develops as removal of a judge from a trial be cloaked in mystery. It isn’t every day that the name of Peng-Chun Chang appears in the New York Times. But there it is, in today’s newspaper, in an op-ed written by Columbia University historian Samuel Moyn. Professor Moyn is the author of The Last Utopia: Human Rights in History, which was published a couple of years ago. Peng-chun Chang and Eleanor Roosevelt in 1948. The occasion for Moyn’s article is the release of Chinese activist Chen Guangcheng a few days ago. Professor Moyn mentions Peng-Chun Chang because he uses the recent events to return to the thesis he sets out in his book about the insignificance of the Universal Declaration of Human Rights. Chang was the Chinese representative on the Commission on Human Rights when the Universal Declaration was being drafted in 1947 and 1948. He has been described as one of the intellectual heavyweights of the Commission at the time. His contributions to the drafting of the Universal Declaration were enormous. In today’s New York Times, Professor Moyn repeats his unfortunate and rather simplistic analysis of the Universal Declaration: ‘The 1948 Universal Declaration of Human Rights — which Peng-Chun Chang, a representative of Nationalist China, helped draft — had virtually no impact on world politics in its time.’ Professor Moyn says human rights did not become a significant factor in international relations until the mid-1970s, when the activities of Soviet dissidents, the election of Jimmy Carter, and the award of the Nobel Peace Prize to Amnesty International transformed the situation. He is dismissive of writers who have spoken of the importance of the Declaration and of its drafters, like Mary Ann Glendon, Johannes Morsink, Elizabeth Borgwaldt and Paul Gordon Lauren, for being ‘celebratory’. But one can acknowledge the significance of the 1970s in terms of the development of international human rights without denigrating the richness of the late 1940s. This is where Professor Moyn is in error. He also suffers from the same celebratory fervour of those he criticizes in failing to recognize the ambiguities of the 1970s. His analysis is also a bit too US-centric. It does not, for example, acknowledge the 1970s as a period when human rights in Europe improved dramatically, and pulled ahead of the United States, which was heading into the tailspin that led to Abu Ghraib and Guantanamo. Take as an example the issue of capital punishment, still practised in France and Spain in the 1970s, at a time when it had been abolished judicially in the United States. Europe went on to universal abolition while the United States Supreme Court reversed itself and reinstated the practice. By focussing on the United States, as he does, Professor Moyn also does not adequately assess the role of the ‘third world’ in the development of modern human rights. There is a tendency – still prevalent today – to view international human rights as a gift from the Global North to the Global South, exported by modern day missionaries from the civilized to the uncivilized. But the history of human rights within the United Nations indicates a very important role for the newly independent countries who joined the organization in the 1960s and who set the elimination of apartheid at the top of their agenda. At the time, Europe and America were running interference for the racist regime in Pretoria, providing it political, economic and moral support. Important breakthroughs in terms of the legal clout of international human rights norms and institutions flowed from the insistence of the ‘third world’ on dealing with this blight. The first efforts to pierce the veil of state sovereignty were about apartheid, and they were driven by the Global South. The Universal Declaration of Human Rights was produced in the ferment of the post-Second World War lawmaking process. It was not alone. Other important legal developments took place, including the adoption of the 1948 Genocide Convention and the 1949 Geneva Conventions, not to mention the immense progress manifested in the Charter of the United Nations itself, and the international trials at Nuremberg and Tokyo. The Cold War intervened to prevent further developments. That is not the fault of the Universal Declaration. Indeed, the Declaration is like many legal instruments that are adopted in periods of change and unrest. They are like seeds in a spring garden, and require water and warmth to germinate and grow. That there is a period of apparent dormancy until this process takes place does not mean that nothing is going on. One could say the same about the fourteenth amendment to the United States constitution, which was adopted in the aftermath of the Civil War but which only delivered its promise in the 1950s and 1960s. Samuel Moyn has very pertinent observations about developments in human rights in the 1970s, but they do not need to be premised on downgrading the importance of the Universal Declaration of Human Rights and the period in which it was drafted. The 1940s were a period of huge tension and contradiction. The world was struggling to bury a past characterized by colonialism and global warfare. Out of this crucible emerged developments of immense importance, including the Universal Declaration of Human Rights. He should adopt a more nuanced and subtle understanding of the development of human rights, one in which there is room for recognition of the significance of both the 1940s and the 1970s. For the sake of full disclosure, my current writing project is a compilation of the drafting history of the Universal Declaration of Human Rights. The materials consist of more than a million words. They are organized chronologically accompanied by annotations and indexes that should make these relatively obscure materials much more accessible to scholars. Within the coming weeks I expect to see page proofs of this three-volume collection of the travaux préparatoires of the Declaration. It is to be published by Cambridge University Press early in 2013. The documents reveal the richness of the debates, the significance of the text, and the inspired brilliance of many of the Declaration’s drafters, including Eleanor Roosevelt and Peng-chun Chang. Liechtenstein is the first State Party to the Rome Statute of the International Criminal Court to ratify the amendments incorporating the crime of genocide within the jurisdiction of the Court. Thirty such ratifications are required for the amendments to enter into force. In addition, the Assembly of States Parties will be required to adopt a resolution confirming the entry into force of the amendments. This cannot take place before 2017. This is a first step towards completing the process that began with adoption of the amendments at the Kampala Review Conference in June 2010. It is fitting that Leichtenstein be the first State Party to ratify, because its Permanent Representative to the United Nations, Ambassador Christian Weneweser, and his key aide, Stefan Barriga, played an indispensable role in the negotiation of the amendments. Together with German academic Claus Kress, Stefan recently published a collection of the drafting history of the aggression amendments. Obtaining the remaining 29 ratifications is complicated by the fact that the NGO community, which did so much to promote ratification of the Statute itself, is dragging its heels. Hopefully the big NGOs will realize the mistake they made with their indifference to the aggression amendments. One way or another, however, there can be little doubt that the thirty ratifications will be obtained by 2017 and that the resolution of the Assembly of States Parties will be adopted without difficulty. Several States have already indicated that they will follow the example of Liechtenstein.